Canal: Thanks to you, we can't afford to be choosey! For breakfast, you blow up the kitchen, for lunch, you blow up the kitchen, and for dinner you blow up the kitchen! Millie: You're just taking the job to check out all the missiles they have! I know it!Canal:That's not true! It's because you cost so much money blowing up the kitchen!Millie: Hey, you're talking to the best cook in the universe!Canal: So what if I am? 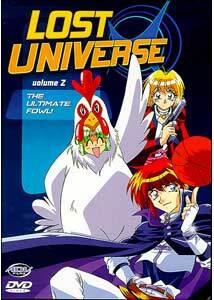 We're buck, buck, buck, back with disc two of six in the Lost Universe series, with another four episodes of this wacky space epic from the creators of Slayers. Our trio of "trouble contractors" go to the ends of the universe to help the needy—for a price—and stir up "buck"-ets of trouble in the process. The strength of the characters is what makes this series work; the infighting is hilarious, as are many of the premises we are asked to accept at face value. Millie's escapades in the kitchen, Canal's many interface snafus, and Kain's obsession over his cape are only a few of the oddities of the series, which so far has been a blast.With Millie's working on her cooking skills—she is the best cook in the universe after all—it is taking a toll on the ship's finances, with explosions becoming the daily equivalent of the dinner bell. The first job offer the crew gets is a boring (and one Millie doesn't think she can become the best of anything at): safeguarding a munitions supply warehouse that is supposed to have its elaborate security system disabled. What? It doesn't? Could it be someone is out to get our team?Doing this line of work can make a person sick, so why not help out at an all-girl nursing school where pre-exam hoaxes are turning serious. The only catch is Canal's program also has a virus, contorting her into unflattering holographic visuals outside her room...leaving Kain to go undercover in drag! This job is going to require some "patients"!Next, the game gets more interesting when we run into another nefarious bunch, as the dreaded Nightmare organization makes its appearance while the crew is rooked into a quest for the missing friend of a dying man. As the pieces fall into place Canal may find herself checkmated, but who will be her knight in shining armor? The final egg-citing episode brings Rail's assistant, Nina, along as interpreter, while the gang escorts a horny official back to his home world, where poultry is precious. The plan was well "hatched," until another group who worship chickens gets into the mix and things go a-"fowl"—it looks like a "coop" is in order. The things they'll do to earn a buck...buck, buck.Once again the humor is abundant, with gaggles of giggles in store. Character development comes in spades, as these likeable bounty hunters face off against the perils of the universe. More elements for an overall plot come into play, as new rivals arrive on the scene. The Japanese voice acting is perfect, elevating the comic potential enormously. The dub, done at Monster Island, is passable, but totally rewrites the script, doing away with some of the funniest lines, and removing a lot of the running gags. While not as manic as Martian Successor Nadesico, I'm certainly getting as much of a kick out of this bunch of whackos as that series. I would be remiss if I didn't mention that this disc does contain one controversial content revision that was raised upon this its release; however, had I not seen the resulting furor, I would have completely overlooked it from just viewing the series. ADV has since invoked a no overlay policy, so I'm not going to elaborate, but if altering content bothers you, look it up on Anime Prime. Image Transfer Review: Colors are strong, grain not over predominant, and aliasing minimal. There is a marked increase in the amount of interlace artifacts over the first disc; however they will probably only be noticed on larger monitors. A few scenes look a little too soft for my liking, and blacks tend to wash out in a couple of places. Considering when this disc was released, this is above average still, with no rainbowing or really glaring defects. Audio Transfer Review: An increase in the amount of distortion on the voices (particularly Kain) lowers the grade here a notch, while the rest of the audio presentation continues to be pleasant in tone, with a nice use of the stereo field in both music and sound effects. The musical cues are great in this series, and I'm really enjoying both opening and closing themes. Extras Review: Disc two brings more front-loaded, but skippable trailers for Generator Gawl,Slayers: The Movie, Martian Successor Nadesico, Gasaraki,Blue Seed and the ADV mix trailer. The main menu also allows access to the trailer reel, though you'll need to chapter skip to the individual titles. Static menus have more elaborate animated transitions than the first disc. The episode chapter count gets a boost as the preview gets its own spot. Japanese seiyuu credits are again on the disc's final chapter. I'll cut them some slack due to the age of this release, but the spine art police have been called in again for inconsistency, and fines are pending. Lost Universe continues to be a fun series of episodic adventures, with strong characters and abundant humor. It gets out there in terms of content, but manages to not be too over-the-top and stays true to itself. I'm looking forward to more!